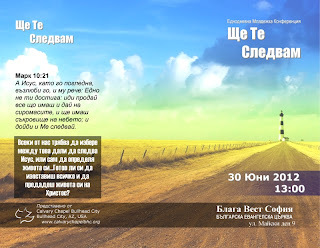 Bulgaria/Macedonia Servant Trip 2015: "I Will Follow"
That is the theme of the one-day youth conference we will be hosting in Sofia on the Saturday after we arrive. 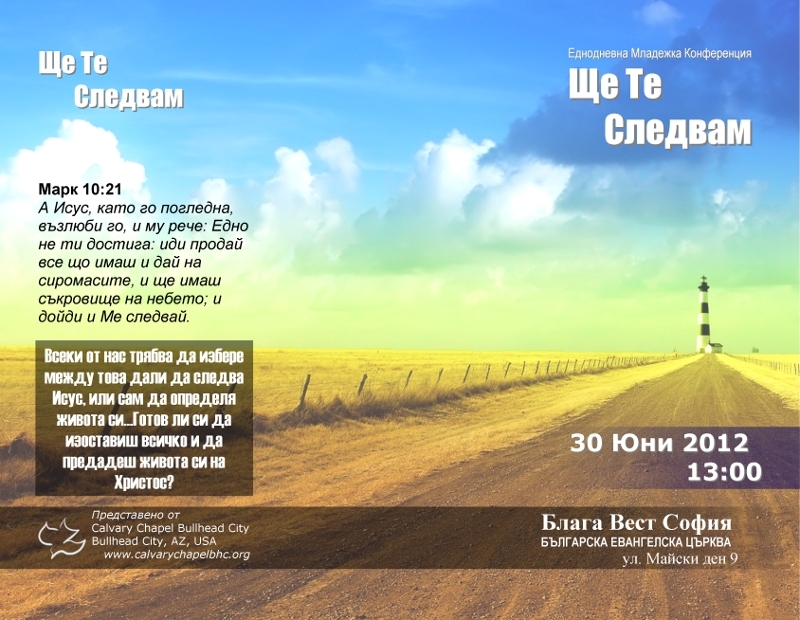 Our desire is to encourage the young people of Bulgaria to not only accept the doctrines of Christianity at an intellectual level, but to passionately pursue Christ as disciples, surrendering their lives to His plans and purposes. Joey, Vernon, and I will teach the main sessions on discipleship, peer pressure and accountability. Joey and Linzi will be breaking out the boys and girls for a lesson on living in purity. There will also be a breakout session with several different classes for the kids to choose from. Our teenagers will be involved in the teaching on these, and we will close with a Q&A session for all the kids to ask questions of our team. Be praying for the conference to go smoothly. It's a lot to plan long-distance! 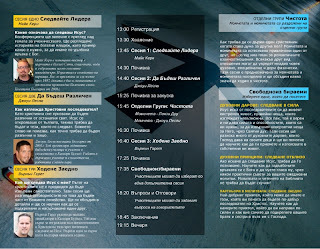 Itzo Yatanski of Blaga Vest has been very helpful in working out details, and we've even put together a nice color brochure for all the kids with the schedule and topic information that we translated into Bulgarian with the help of our good friend Simona Ivanova. When its all over, we're serving a taco dinner to the whole crowd, with salad and a side of refried beans for a little taste of home BG-style. Please keep this conference in prayer. It is a new endeavor for us, but one we've been talking and praying about for several years. 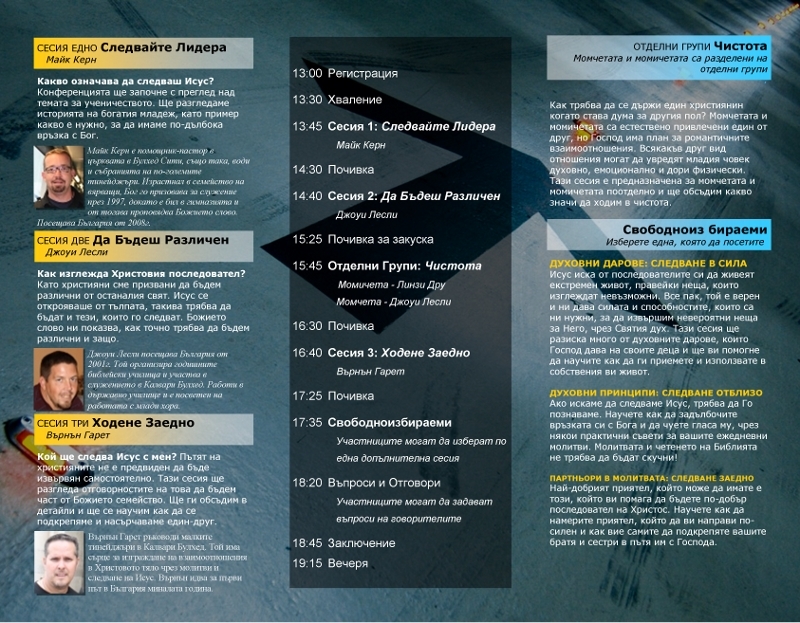 We're expecting about 40 kids from Sofia, Elin Pelin, Gabrovo and Macedonia. We really need to be led by the Holy Spirit to minister to these kids and point them toward a radical relationship with Christ as His followers!